The decision of US president Donald Trump to pull his country out of the Paris Climate Agreement has the potential to stymy global efforts to prevent additional increases in global average temperatures and associated climate changes. 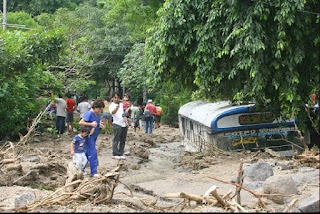 El Salvador and other countries in Central America are particularly at risk from the impact of these climate changes. El Salvador ranks number 15 out of 180 countries on the 2017 Global Climate Risk Index which is based on the country's exposure to extreme weather events during the twenty year period between 1996 and 2015. The index takes into account both deaths and injuries as well as property and economic losses. Using a different measure, El Salvador ranked number 11 out of 171 countries on the 2016 World Risk Index. That index ranks both a country's exposure to natural disasters as well as the capacity to respond to such disasters. El Salvador is a signatory to the Paris agreement and is well aware of the effects, present and future, of climate change. In contrast, the president of the most powerful country in the world, has no such awareness / just does not care. A more enlightened policy would seek to protect threatened countries around the world from the effects of climate change, in order to avoid climate catastrophes which might drive even more migration from afflicted areas. As a Trump-hater, your goals are justified even if promoted by false information and distorted truth! The destruction in the photo is more about deforestation by subsistence farmers on overly steep slopes causing unstable soil and erosion and non-enforcement of laws prohibiting it! Second, zoning laws were established but ignored which allowed building and development in the steep canyons draining off the side of steep volcanoes. Extreme weather has little to do with it! In the rural areas were I lived during this and many other storms, the well healed forests handles the water amazingly well! The causes of this unfortunate destruction was very well documented in the news papers at the time. And lets face it, the problem in El Salvador is over population. Until the country, including the church, starts dealing with this reality, El Salvador's problems will continue and be forced on other countries (illegal immigration). Sorry your candidate lost the election!